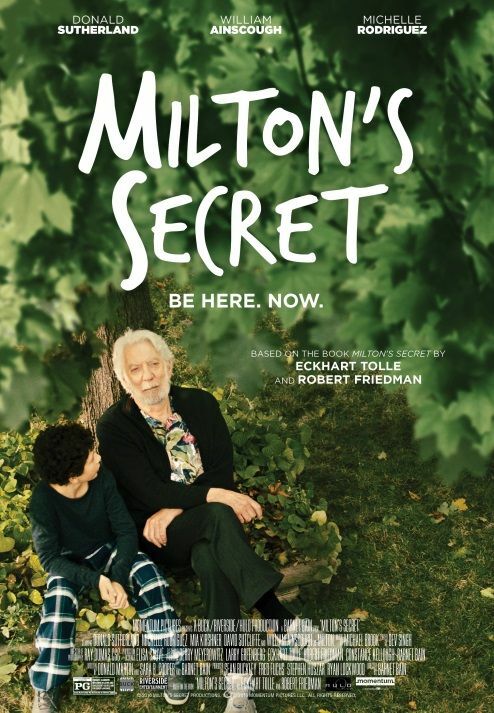 Based on the book by #1 New York Times bestselling author Eckhart Tolle and Robert Friedman, Milton’s Secret is a movie about family and the uncertain times families live in. Milton is a 12 year-old boy growing up in an economically and socially unpredictable world. His mother and father (Mia Kirshner, David Sutcliffe) are workaholics with marital and financial problems, and he is bullied at school. When his grandfather (Donald Sutherland) visits, Milton learns rehashing the past and worrying about the future are preventing him from finding true happiness. Milton's mom, very smart and ambitious lady, works as Real Estate Agent and always worries about the future, how they are going to live and they may lose the house. Milton's dad is always on the phone not to miss an important call. The boy sees everyone on their own planet and often tells what is happening there, on Planet Fear or Planet Future. Trying to help his mom, Milton tries to make gold during multiple experiments after school with his friend, so that they can sell gold and do not worry any more about the future. The bully at school makes a nasty record of Milton and posts it on-line. Everything falls apart for a young boy until Milton's grandfather comes to change everyone's life in his family. Mostly Granddad does not do anything complicated, he just shows what everyone should care for, how to enjoy every moment of your life happening right now. The most symbolic is the gift given to Milton by his grandfather, it is a beaker, just a big empty beaker to fill with what you want to get for your life. If you fill the beaker with beauty it will be beautiful, if you fill the beaker with pain and hate, the life will be miserable. Milton’s Secret premiered at this year’s Vancouver International Film Festival to a very enthusiastic audience. The movie was filmed in Canada: in Vancouver, Hamilton and Brampton (no Milton surprisingly). Milton’s Secret takes complex spiritual and philosophical ideas and turns them into an amazing, concise story of love, compassion and overcoming obstacles in a beautiful coming-of-age story. The film is released November 1st and now on available Amazon, iTunes and On-Demand. We are happy to give away on copy of this inspiring movie to one our lucky Canadian reader thanks to eOneFilms. The giveaway ends November 20, 2016. Good Luck! This looks like the perfect movie for my aunt. She loves a good story! I like to win to watch it with the family. I would like to win it for myself, I like Donald Sutherland! I like Donald Sutherland,i would love to win this for myself ! Would love to win for our family to watch together! I would like to win it for myself to watch with my daughter! I would like to win this for my mom. I think that my kids and husband would enjoy watching this together. Thanks for hosting. I would like to win it for the family.